After an extremely cold February in New York City, we were all ready for warmer days and this dinner was a wistful way of anticipating spring’s arrival. Never mind that we just had six inches of snow the day before. Our guest list included Diana Kuan of Appetite for China, Jackie Gordon, Margaret Chen of Savory Sweet Living, Ken Leung of Hungry Rabbit, and Matt Bruck, a group of friends made through blogging and various culinary ventures. I knew these people were heavy-duty foodies with very discriminating tastes. Needless to say making dinner for them could be a nerve-racking proposition, which partly explained why it took me this long to agree to host a dinner. 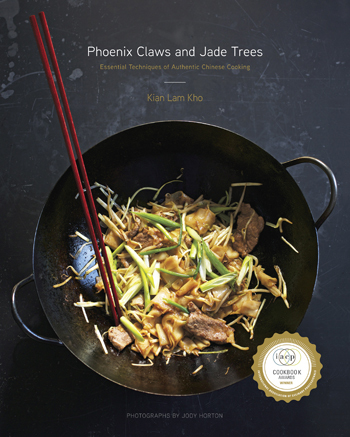 I settled on a menu that emphasized seafood and lighter flavors, making it a good early spring tasting of my brand of Chinese cooking that uses fresh ingredients and has multi-regional characteristics. A few items on the menu were standards such as the assorted cold dishes, Red Cooked Pork, and Stir-Fried Sea Cucumber with Leeks. Stir-Fried Shrimp and Scallop with White Wine Lees, Crisp-Fried Red Snapper with Cumin and Garlic, and Croaker Soup with Dill added unusual regional flavors from the Shanghai, Dongbei and Yunnan respectively. I also made a simple Crispy Roast Duck and Lobster and Yellow Chive Fried Rice to round out the savory part of the menu. Even the tea service was gorgeous & delicious at @RedCooking's #SpringAwakeningDinner. For dessert I decided to make two items: Red Bean Meringue Dumplings, which are a popular Beijing style sweet snack, and Purple Yam Mochi Balls in Ginger Syrup. This mochi ball dish is known as Tangyuan (湯圓) in Mandarin and is always served during Yuanxiao at the end of the New Year celebration. Made with glutinous rice flour, they can be sweet or savory. There are a myriad of variations for making them. Some are filled with sweet pastes and others are just plain balls of glutinous rounds. 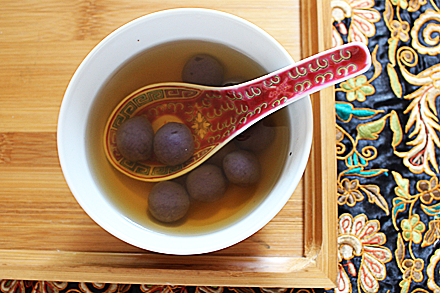 For this dinner I decided to make my tangyuan with purple yam and serve them in a simple ginger syrup. 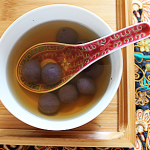 You can make these tangyuan any time of the year by following my recipe below. Since the dinner on that bitter cold night, we’ve had incredible spring-like weather. All the snow has melted and soon the spring bulbs will be blooming. I am pleased the dinner really welcomed the spring. And judging from my guests’ Instagram postings, they had a good time as well. Put the purple yam in a small mixing bowl and place the bowl in a steamer. Steam the yam covered over boiling water for 30 minutes. Remove the purple yam from the steamer and immediately add the glutinous rice flour. 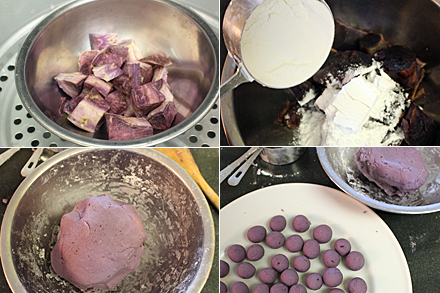 Mash the purple yam together with the glutinous rice flour to create a flakey starch mixture. Add the boiling water and mix well. A soft dough should form at this point. Pinch about ½ teaspoonful of the dough and roll it into a ball about ½ inch in diameter. Continue to form dough balls until the dough if completely used up. There should be about 60 balls. Combine all the ginger syrup ingredients together in a saucepan. Bring the liquid to a boil then turn the heat o medium low and simmer for about 30 minutes. 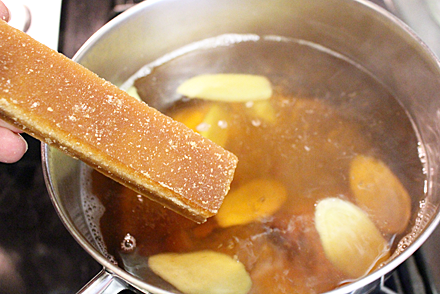 Discard the ginger slices and reserve the syrup. Bring a pot of water to a boil and turn the heat to medium. Drop all the mochi balls into the boiling water and let cook for about 15 minutes or until all the balls float to the top. Drain the mochi balls and add them to the ginger syrup and serve hot. OMG! How many days/weeeks did you take to put the dinner together? It looks beautiful and delicious! Really didn’t take me that long. I had fun putting the dinner together. Come up to NYC and I’ll cook for you.